The SS501 members gave their mics to their leader, Kim Hyun Joong as he said, "It's a difficult question to answer. We can't really compare between the groups because we are of different styles, in terms of dance, songs and charisma. Furthermore, there's no confirmation about their disbandment in Korea as yet. We are just focusing on our tasks at hand and don't know the details of the whole situation. 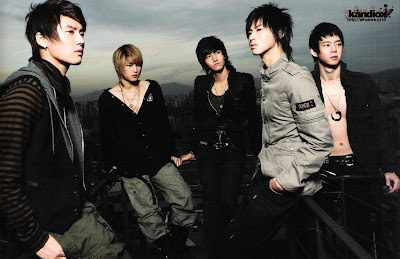 But we hope that they (TVXQ) can settle this in a good way and that their fans will continue to support them." OH Wow...Great answer Hyun Joong !! My guess is Kim Hyun Joong and SS501 would be sad too if TVXQ really disbands...aren't Jae Joong & Yoochun Hyun Joong's good buddies? He he he....they gave the mike to Leader .....even Jung Min didn't try to answer. Photo credit as labeled, google search result.